Our nationally renowned physicians treat patients of all ages and stages of life, from prenatal care to the senior years. Cardiovascular Medicine - Heart disease is the leading cause of death in the United States. Each year, more than 10,000 people lose their lives to cardiovascular disease. But the pioneering health care professionals at University of Louisville Physicians-Cardiovascular Medicine are working to reverse those trends, and help you and your loved ones live longer, healthier lives. Cardio-Oncology - When cancer and heart disease are combined, managing both conditions can be challenging for both patients and doctors. This novel new discipline between cardiology and oncology is referred to as "Cardio-Oncology." The UofL Physicians Cardio-Oncology team works to maximize the use of lifesaving chemotherapy and minimize any delays in cancer treatment plans to optimize the care for each individual patient. Diabetes & Obesity Center - The Diabetes and Obesity Center at UofL Physicians offers education and support regardless if you are newly-diagnosed with diabetes, or if you’ve had diabetes for many years. Our diabetes educators can assess your needs, and help you enroll in an education class right for you. Digestive & Liver Health (Gastroenterology) - The doctors of University of Louisville Physicians-Digestive & Liver Health are renowned for their skill in treating disorders of the digestive system, pancreas and liver. They provide expert patient care for common, as well as complex conditions, such as inflammatory bowel disease, advanced liver disease and gastrointestinal cancer. Endocrinology - University of Louisville Physicians-Endocrinology provides sophisticated, cutting-edge diagnostic and therapeutic care for patients with a broad range of hormonal disorders in the Louisville, Southern Indiana and greater Kentucky areas. We see patients from all over the United States, as far away as New York and Pennsylvania, with complicated endocrine disorders. Heart Valve Team - The University of Louisville Physicians Heart Valve Team at Jewish Hospitalis a leading-edge team of cardiovascular specialists dedicated to developing and performing advanced cardiovascular treatments for valvular heart disease in patients at high risk for conventional surgical valve repair/replacement. Infectious Diseases - University of Louisville Physicians Physicians-Infectious Diseases is actively involved in patient care, research and teaching. The practice assists in the diagnosis and management of patients with a wide variety of infectious diseases, including 1,200 HIV patients in the ambulatory clinics of the University of Louisville and the Veterans Administration hospital. In addition, our infectious disease specialists are focused on the research and treatment of pneumonia and other common respiratory diseases. Internal Medicine - The internists at University of Louisville Physicians handle the broad and comprehensive spectrum of illnesses that affect adults. We are recognized as experts in diagnosis, in treatment of chronic illnesses, and in health promotion and disease prevention. Internists are the "doctor's doctor," because we are often called upon to serve as consultants to other physicians to help solve baffling diagnostic problems. 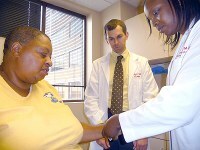 Kidney Disease Program (Nephrology) - University of Louisville Physicians-Kidney Disease Program is one of the oldest nephrology practices in Louisville and has been active for more than 50 years. Each year, we have more than 5,000 patient visits. We are made up of a compassionate and caring multidisciplinary team of kidney specialists (nephrologists), nurses, dieticians and social workers who are dedicated to educating and treating the community of patients living with kidney disease. LGBTQ Care - UofL Physicians and the UofL School of Medicine have joined together with the LGBT Center and community members to develop an important initiative focused on addressing the health care needs of the LGBTQ community. Our goal is to develop services that support the diverse needs of the LGBTQ community through improved access, provider and team member training, and the implementation of a comprehensive patient care model. Medical Oncology & Hematology (Cancer) - The medical oncologists at University of Louisville Physicians are part of the UofL James Graham Brown Cancer Center, where we practice as part of multidisciplinary teams of specialists. We use sophisticated technologies and the latest combination of therapies to provide each patient with an individual comprehensive treatment plan. Primary Care - The internists at UofL Physicians-Primary Care Downtown handle the broad and comprehensive spectrum of illnesses that affect adults. We are recognized as experts in diagnosis, in treatment of chronic illnesses, and in health promotion and disease. Pulmonary - Thousands of people each year suffer from ailments associated with the lungs. In Kentucky, lung problems are particularly prevalent because of the state's high number of smokers, high rate of allergy sufferers, and occupational lung diseases. Look no further for your experts in lung health than the doctors of University of Louisville Physicians-Pulmonary/Critical Care. We'll help you to breathe easy again. Pulmonary Fibrosis - The UofL Physicians–Pulmonary Fibrosis Care Center is one of nine pilot sites selected by the Pulmonary Fibrosis Foundation (PFF) for its newly established Care Center Network and Patient Registry program. We were selected because of our expertise in pulmonary fibrosis patient care and research, and the dedication of our world-renowned pulmonary doctors. Sleep Medicine - Many of us have experienced trouble sleeping at some point in our lives. The doctors at University of Louisville Physicians-Sleep Medicine understand that poor quality sleep can have a negative impact on all areas of your life. Our physicians are nationally regarded for their expertise in the diagnosis, treatment and care of sleep disorders. Transplant - We perform a large number of transplants for many organs, and our years of experience translate to better outcomes for our patients. UofL Physicians are part of collaborative multidisciplinary teams that includes surgeons, anesthesiologists, nurses, infectious disease specialists, researchers, rehabilitation consultants, social workers, dietitians, psychiatrists, pharmacists and financial coordinators, who all bring a unique set of skills to the table. Vaccine & International Travel Center - The UofL Physicians-Vaccine & International Travel Center specializes in adult and adolescent infectious diseases and vaccines, infection prevention and control, and public and global health. Our doctors are board-certified in internal medicine and infectious diseases, and we have expertise in the most current and effective prevention and treatments available. we are experts in travel medicine and travel health. We offer a full spectrum of vaccine and travel services. For more information or to make an appointment, call 502-562-2822.